The times when visual content was associated with more 'light-hearted' businesses like entertainment or lifestyle journalism are long gone. Social media conquest of Internet proved that people love visuals and turned channels centered around images alone like Instagram, Pinterest or YouTube into marketing goldmines. Our fondness for sharing memes and beautiful images isn't accidental but rather natural and has been explained by many scientific publications. It's high time smart businesses noticed this potential and leveraged the visual trend in their daily work with data. Visuals can quickly affect us both cognitively and emotionally. According to a research on the effects of illustrations, they are capable of increasing comprehension, recollection, and retention. It is easier to show a picture of a circle than to describe one - graphics expedite and facilitate communication, they allow us to get the message through more easily. Visual aids help us decode text and attract audience's attention to information or direct focus on certain aspects. Graphics engage our imagination and boost our creative thinking by stimulating other areas of our brain than the text alone. Combining image and text leads to a more profound and accurate understanding of the presented material. The days of boring slide presentations and reports in the form of sheets with myriad rows of numbers are over. Although the volumes of data enterprises could potentially be recording are growing, businesses have already realized that they must be selective about what they monitor. The only way to draw meaningful insights from data is to focus on most important KPIs and to personalize the information for its receiver. 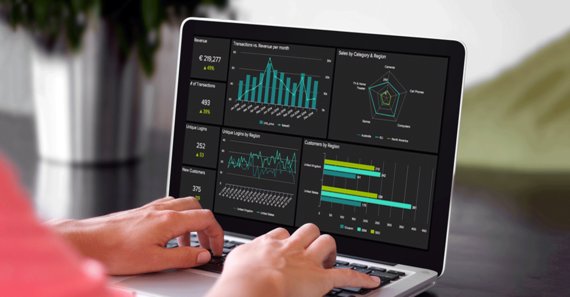 Innovative software solutions like datapine allow you to create advanced data visualizations and interactive corporate dashboards on your own, without any IT support. 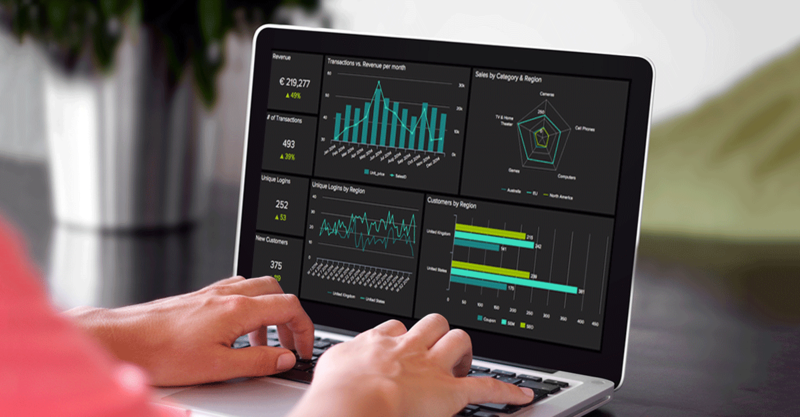 Moreover, such data visualization software provides businesses with an added value of gathering real-time data from various data sources in one place, which in turn empowers you to access and combine all your information using one single platform. You can generate meaningful and visually compelling charts and share them with your colleagues on the fly to make better, data-driven decisions. We are now used to fast-paced, clear and exciting visual content and that is exactly why we recommend a software like datapine to deliver it to your coworkers and clients. Statistics show that 65 percent of humans are visual learners and that the brain processes visual information 60,000 times faster than text. Therefore, if you're giving a presentation without any type of visual content, you're deviating from your audience's capabilities and making it harder for them to understand your message. Add to this ever shorter attention spans and you can be sure that you don't have much time to convey your business insights. Just look at new mobile applications that are gaining more and more popularity like Vine or Snapchat. Users have six seconds of video or a picture that disappears after five seconds to get their point across. You don't have to be that fast but if you want to communicate a large amount of information with your business partners, you need to get straight to the point that interests them. Data represented visually on charts and infographics allow you to show more in less time. Another study proves that the old saying "seeing is believing" is mostly true. Visuals are persuasive. The Stanford Persuasive Technology Lab asked 2,684 participants how they evaluated the credibility of web sites they were shown. Almost half (46.1%) said that the web site's design look was the number one criterion for discerning the credibility of the presented material. It also corroborates another well-known truth - we judge a book by its cover. So if you want your data and the insights you draw from it look reliably and convincingly, never underestimate the opinions your audience forms in those first precious seconds. Show your audience clear and meaningful data visualizations, make a great first impression and persuade your viewers to your data. We already stated that people love visual content and social media. You can combine those two tendencies, if you manage to create interesting and informative data visualization and allow your audience to share it. Of course, it's not easy to create a viral content - it must be free from any data visualization mistakes, concern a relevant or recent subject, be informative and useful. However, if you manage to fulfill those conditions, the data visualization you produce and share can expose your business to new audiences and markets at a very small cost. Your branded data visualizations can be shared via social media channels or embedded in websites or blogs. With visuals you can direct Internet-users attention towards your business and create valuable links that will lead to your website. Consider replacing your slideshow presentations and non-visual reports with data visualizations and benefit from increased attention, retainment and engagement with both your customers and your employees. Nowadays the shift to innovative data visualization software is no longer a big investment. You can try most providers for free and create your own stunning data visualizations with a few clicks.